A banking court issued non-bailable arrest warrants against Pakistan's former president Asif Ali Zardari. 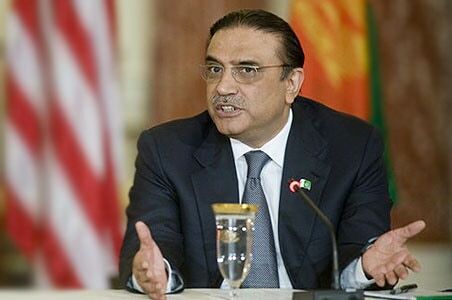 A banking court in Karachi today issued non-bailable arrest warrants against Pakistan's former president and PPP co-chairman Asif Ali Zardari and 15 other suspects in the fake bank accounts scam case, according to a media report. During the hearing of Rs 35 billion money laundering case, the court directed authorities to arrest and present former president Zardari, 63, before it by September 4, the Express Tribune reported. However, PPP spokesperson Farhatullah Babar issued a statement in which he quoted Mr Zardari's counsel Farooq H Naek as saying that no warrants against the former president have been issued. The Federal Investigation Agency (FIA) had declared Mr Zardari and his sister Faryal Talpur, along with 18 other suspects, as absconders in an interim charge sheet filed in the case. Ms Talpur had, however, obtained a bail against her arrest. The fake accounts case revolves around a 2015 inquiry into suspicious transactions when 29 'benami' accounts were identified, 16 of them in the Summit Bank, eight in the Sindh Bank and five in the United Bank Limited. The prosecution today stated that arrest warrants were issued in an earlier hearing for the accused who were declared absconders in the charge sheet submitted by the investigative agency in July. Former Pakistan Stock Exchange (PSX) chairman Hussain Lawai is among the accused. Speaking to media, an FIA representative said the remand was to further probe and obtain documents from the accused in the money laundering case. The hearing has been adjourned till August 25.